John De St. Croix is escorted into the courtroom at the Penobscot Judicial Center in Bangor. The man accused of killing two people almost a year ago by setting the box truck where they were sleeping on fire goes on trial this week in Bangor. Jury selection began Monday at the Penobscot Judicial Center in the murder trial of John De St. Croix. He is accused of killing Michael Bridges and Desiree York, two members of Bangor’s homeless community who were found March 28, 2018, in the back of a blazing box truck in Bangor. De St. Croix, 26, of Bangor allegedly told police that he intentionally set the fire but intended to harm only one of the victims. The bodies of Bridges, 43, and York, 36, were locked inside the truck when De St. Croix allegedly set it on fire. He told police his intention was to hurt Bridges, not York. The truck was located at the Penobscot Plaza shopping center on Washington Street. 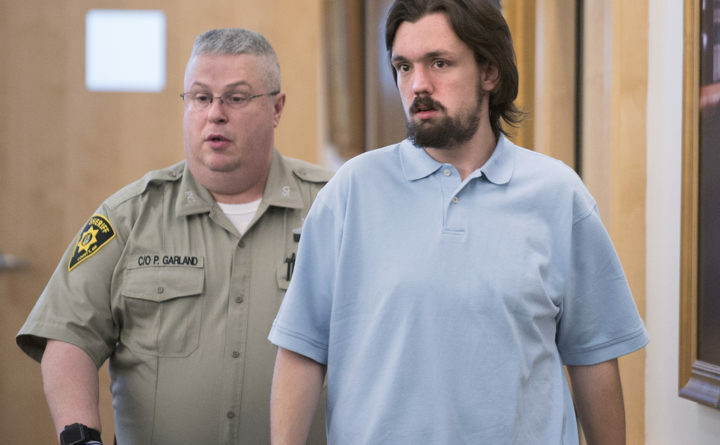 De St. Croix has pleaded not guilty to one count each of intentional or knowing or depraved indifference murder, depraved indifference murder, arson and two counts of felony murder. Felony murder in Maine is defined as causing the death of another person while committing a crime such as arson, robbery, burglary or other illegal acts. The charges appear to reflect De St. Croix’s alleged confession that one of the victims was killed intentionally but the other’s death was unintentional. Felony murder appears to have been included as a charge as an alternative to the other murder counts. The trial is expected to begin Tuesday after jurors are chosen before Superior Court Justice Ann Murray. Testimony is scheduled to conclude early next week. De St. Croix allegedly told police two days after the fire that he was angry with Bridges because earlier in the day Bridges had threatened to hit York, the affidavit said. He also said he had been drinking that day with both victims and others under the Penobscot Bridge. Bridges and York were dead by the time Bangor firefighters arrived. The Maine medical examiner’s office found that both died of asphyxiation, the affidavit said. De St. Croix has been held without bail at the Penobscot County Jail since his arrest March 30, 2018. If convicted of murder, he faces between 25 years and life in prison. He faces up to 30 years in prison if convicted of felony murder and/or arson.